CCS is happy to welcome Dianne Baker and Louise Simbanduwe to kick off our 2012-2013 Second Friday series of noon-hour learnings, at 12 noon on Friday, September 14. Dianne and Louise will be discussing accompaniment and solidarity. Dianne Baker served with the Ecumenical Accompaniment Program in Palestine and Israel for three months in 2011. She also worked as an Overseas Partners in Trinidad and Tobago for three years. She is presently employed as a Family therapy Clinician at New Directions in Winnipeg. Louise Simbanduwe is Director of Asset Building Programs for SEED Winnipeg. She has over 15 years of experience in a variety of local and international CED work. She has worked on development projects in Bangladesh, India, and South Africa. At a local level, she was involved in establishing a worker’s collective based on participatory economic principles. She has been actively involved in Amnesty International. 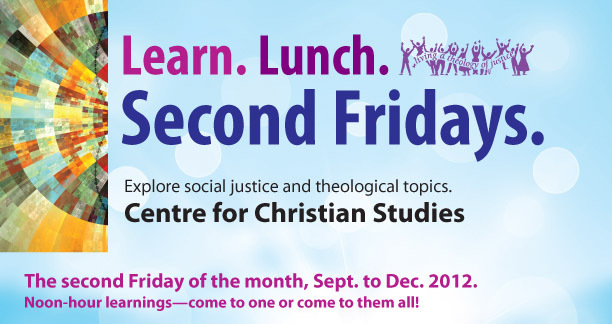 Second Friday gatherings take place at the Centre for Christian Studies, 60 Maryland, starting at 12 noon on the second Friday of each month (hence the name). Bring your lunch. Presenters will provide a brief introduction to the topic, followed by time for small group discussion and question and answers. If you’re planning on coming, contact Ted at tdodd@ccsonline.ca or call 1-866-780-8887.